The appearance of the Stone Row at Goles was very disappointing at first, the site appeared somewhat neglected and the wooden gateway into the enclosure that the row stands in failed to open, also the grass inside the enclosure is badly overgrown, but on reflection this hopefully is due to the fact that it had not stopped raining for about five weeks prior to my visit and indeed it was still pouring down on the day I dropped by. 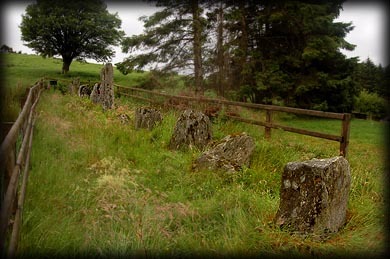 The row consists of eleven stones varying in height from as low as 0.65 metres up to a height of 1.60 metres and is situated on the lower southern slopes of the Oughtvabeg mountain. The row is 16 metres in length and orientated north-south, it is thought to be aligned with a small notch in the Carnanelly mountain to the south. As you can see from the top of the left image it was quite misty on the day we visited, but I did see the notch on at least one occasion. Situated: From Draperstown in Derry take the B47 south for about 3 kilometres, keep right at Owenreagh bridge still on the B47, the site is about 8 kilometres down here approximately 1 kilometre beyond Goles Forest. Discoverer Map 13: H 6697 9481. Last visit July 2007.